The Mormon church has pledged to roll back a series of anti-LGBT policies introduced four years ago. Around 1,500 people reportedly left the church in protest when its anti-LGBT polices were rolled out in 2015. Members of the church worship Jesus Christ, but have substantial differences in belief to the Catholic, Protestant, and Orthodox Christian denominations. Known as the Church of Jesus Christ of Latter-Day Saints, it claims 16m members worldwide. Its followers include 2012 US Republican presidential candidate Mitt Romney. 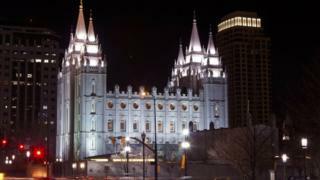 The new "positive policies" were announced on Thursday by church leader Dallin Oaks at a conference in Salt Lake City. The group said it would allow children of LGBT parents to be baptised so long as they had parental approval. As part of the changes gay marriage would also be considered "a serious transgression" but not an "act of apostasy". "Instead, the immoral conduct in heterosexual or homosexual relationships will be treated in the same way," the group added. Mr Oaks said the changes sought to "reduce the hate and contention so common today," but he insisted they did not represent a shift in church doctrine on marriage, chastity and morality. These latest policy reversals are the biggest moves yet by church president Russell Nelson, who took office last year. For the followers of the church, the president is a prophet who receives divine revelations. Under his leadership, it has severed its long-standing ties to the Boy Scouts of America, and campaigned for the eradication of nicknames like "Mormon" to characterise the faith. In its latest statement, church said that "some changes to policy inspired by revelation are only for a short time".